Millions of Americans work for companies that sponsor a tax-advantaged 401(k) plan, and the amount of money these individuals have been able to set aside for retirement using such savings vehicles is substantial. For example, an updated report released last week by the Investment Company Institute (ICI) calculated that $7.7 trillion were held in 401(k)s and other defined contribution (DC) plans at the end of the first half of 2018 (most current data available). 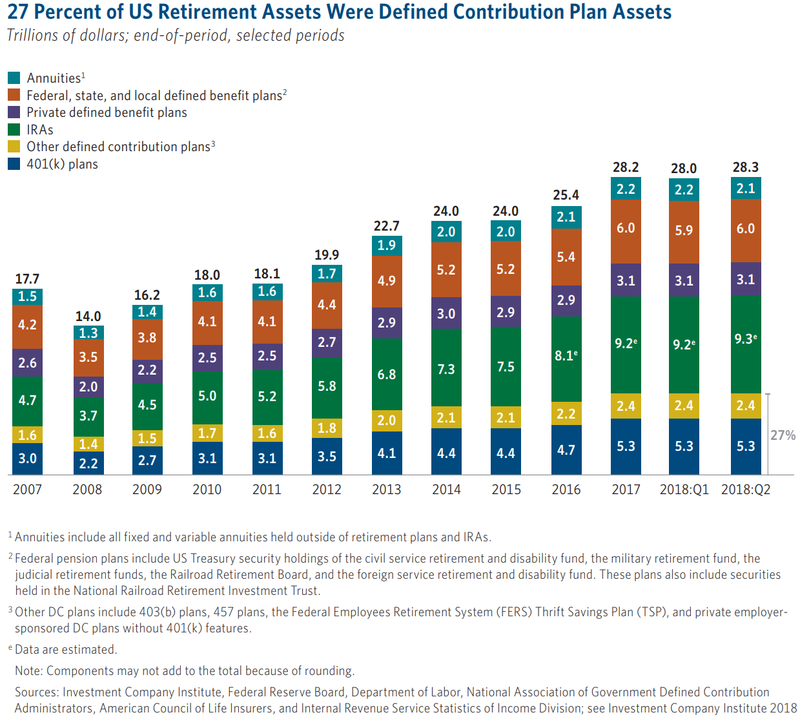 That represented more than a quarter (27 percent) of all the retirement assets in the United States and equated to roughly one-tenth of Americans’ aggregate financial assets. Moreover, total retirement assets ended H1 at a new all-time high and have more than doubled since 2008, highlighting the significant rebound consistent participants in DC plans have been able to enjoy during this period. Despite the recent volatility in the stock market, the benchmark S&P 500 index (as of this writing) is only fractionally below June’s closing level, meaning there is still a chance of another solid gain in retirement assets being seen when the data for the second half of 2018 is released. 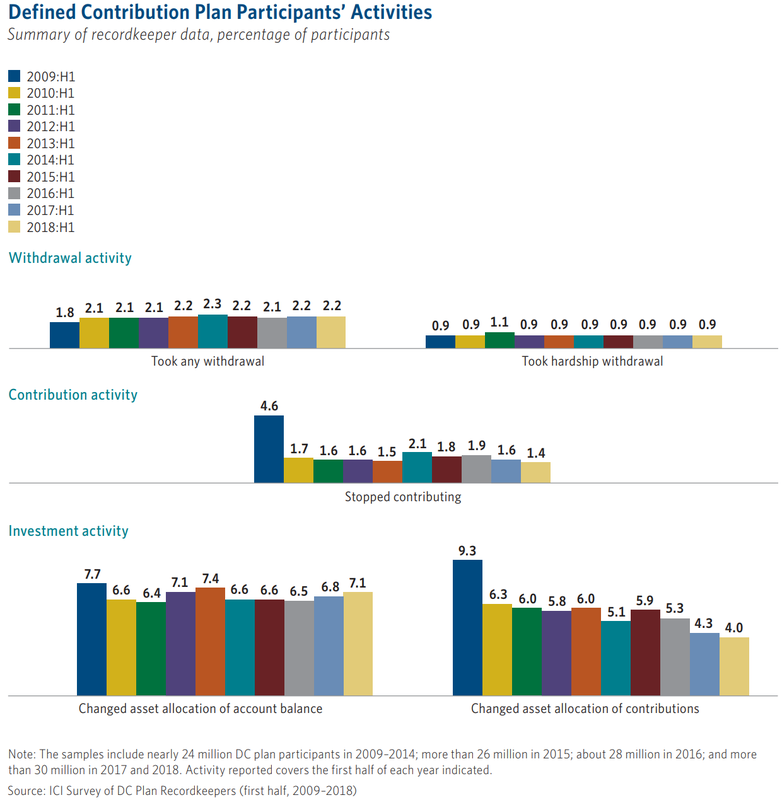 More importantly, the ICI report also revealed that only 1.4 percent of account owners stopped making contributions to their 401(k)s and other DC plans during the first six months of 2018, the best reading of the current business cycle. 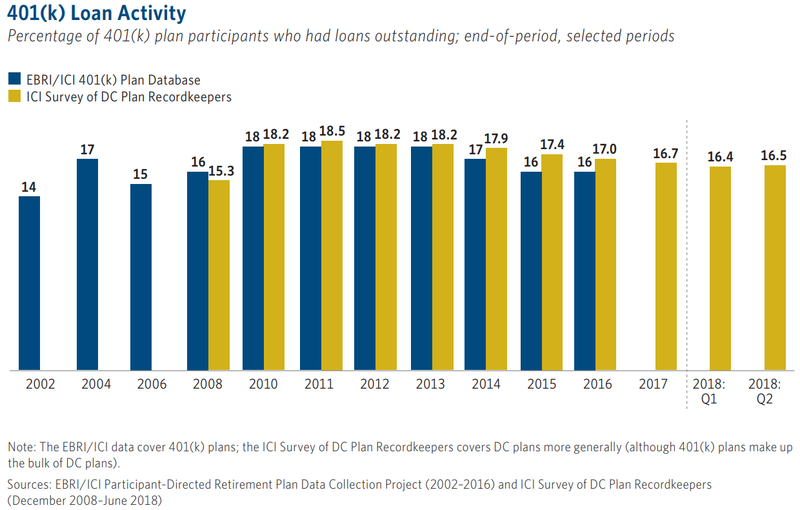 Further, hardship withdrawals were taken by just 0.9 percent of DC plan participants during the first two quarters of 2018, matching the record low, and only 2.2 percent of participants made any sort of withdrawal. 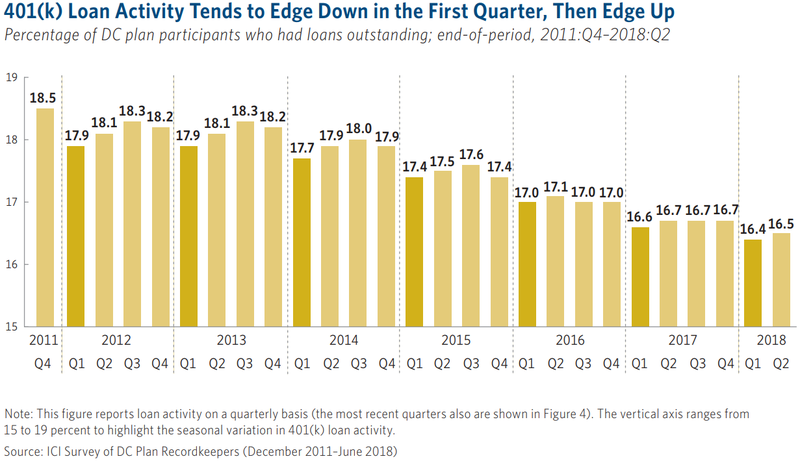 As for borrowing activity, just 16.5 percent of all 401(k) plan participants had a related loan outstanding at the end of Q2 2018. That is up slightly from the start of the year but in line with the recent seasonal pattern and still one of the best readings of the past two decades. 401(k) borrowing remains relatively low as a tightening labor market and an uptick in wage growth have provided Americans with more disposable income, and in turn lessened the need to tap into retirement assets early. That is encouraging since it is generally a good idea to never touch your long-term savings until you are truly ready to retire. In fact, a well-known study by the Pension Research Council at the Wharton School found that when it comes to actually paying back the borrowed funds, one in ten 401(k) loans are never repaid in full. Job changes appear to be the most common reason for this because a staggering 86 percent of examined borrowers switching to a new employer were found to have defaulted on an outstanding 401(k) loan. Unsurprisingly, default rates were even higher for participants with multiple 401(k) loans. More information from the study’s authors can be found in the video below.